Keeping up with the flow, Honda has provided us with a very well put together small HR-V SUV. It’s excellent design has me wondering how they managed to get so much space out of small SUV proportions. But that’s something Honda has been surprising us with for years. They are experts in building cleverly roomy vehicles no matter what the dimensions. In 2015, we see the HR-V boasts a new and more powerful engine and a whole heap of safety kit, too. 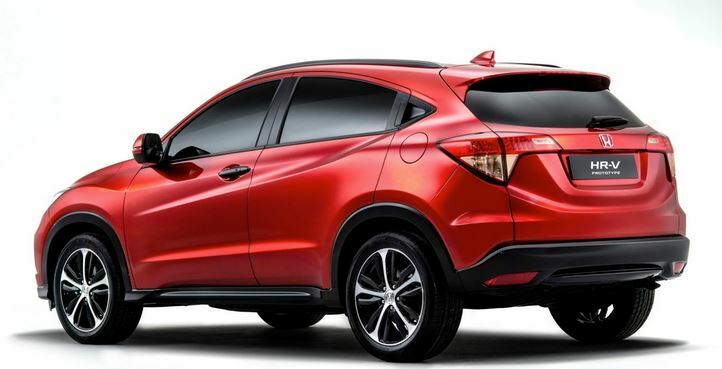 In all, the Honda HR-V is the sort of car that will end up being part of the family as well as transporting the family. If you get one and decide to give it a nickname, ten to one you’ll call it Harvey (which is more or less how you pronounce HR-V). There is a very strong market for small SUVs – and not just for the wee hairdresser types. Something that the latest Honda HR-V isn’t is a dinky-wee scooter. You can take the HR-V a number of surprisingly out of the way places, much like its bigger sibling, the Honda CR-V. A sound platform and Honda’s excellent build quality makes the Honda HR-V a sturdy and solid machine. Under the bonnet, Honda have provided the new HR-V with more power in the form of the gutsy 1.8-litre SOHC i-VTEC 4-cylinder engine. You’ll be familiar with this type of engine in the Accord and Civics. Strong performance, particularly above 4000 rpm, and superior fuel efficiency make them a great match for the new HR-V. Linked to the Continuously Variable Transmission (CVT), the 1.8-litre petrol engine is exceptionally smooth. Honda claim that you can return around 7 litres/100 km, on average, depending on which model of the Honda HR-V you pick (VTi, VTi-S, VTi-L or VTi-L + ADAS). In reality, you probably won’t quite manage to squeeze this out of it, but that’s the case with all vehicles driven in the real world instead of on a windproof and perfectly flat test track with no load. However, the Honda HR-V still has pretty good fuel economy stats, which is another feature that makes this SUV family friendly. The Honda HR-V looks the part of a well-groomed and snappy-looking family car (the sort of thing that the kids won’t mind taking them to the school gate and that the teenagers will want to borrow). It sits proudly on 16-inch alloy wheels (or bigger ones if you opt for something more than the base model VTi), has some nice modern sculpturing along the sides and bonnet, and those LED tail lights just about wink at you. And well they might wink. This is a car with a bit of a hidden secret in its exterior styling. At first glance, it looks like an ordinary 3-door compact SUV. Look again, and you’ll discover that it’s actually a 5-door model, with cunningly hidden rear door handles hiding behind the window. It’s one of those clever little features that makes you why someone else didn’t think of this earlier. I guess someone has to be the pioneer, and in this case, the pioneer is the Honda HR-V.
Another quite fun special feature of the Honda HR-V that makes it a great family vehicle that won’t take up too much space in the driveway but will go everywhere with everyone is the inclusion of Magic Seats. Magic seats don’t just fold down flat so that you can put a long load in the rear compartment. They also fold up, meaning that the actual seat part (the thing that you put your bottom on) can fold up and out of the way as well. This means that if you have something tall that needs to be stored upright, you simply tuck the seat up out of the way and use the depth of the footwell without the seat getting in the way. It’s just the thing if you’ve got a tall potted plant that needs to be transported. Needless to say, the Honda HR-V has all the other things that go towards making a family car family-friendly: climate control, front console power outlet (for charging up the phones and other devices), six cupholders sprinkled around the place so other things don’t get sprinkled on the fabric upholstery and coathangers to keep the “car wardrobe” (inevitable in a family-sized SUV. The multimedia system has two USB ports as well as the usual CD player and AM/FM radio, a touch-sensitive display screen with customizable wallpaper and an MP4 video file player (which has the common sense of only operating when the vehicle is at a standstill). 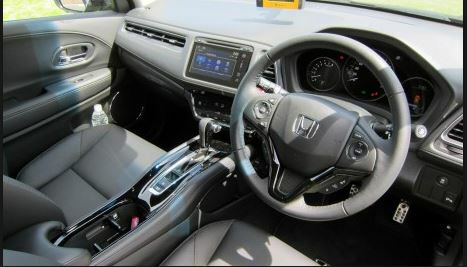 The driver will probably appreciate the convenience of the multi-angle reversing camera, the wheel-mounted audio controls, the cruise control, the nice big 7-inch display screen, the Bluetooth integration and the SIRI eyes-free function for communications. And that’s just in the basic VTi model of the Honda HR-V. The VTi-S adds in some extra power sockets, chrome trim, a leather-wrapped steering wheel, plus some extra safety features in the form of the City Brake Active System (automatically detects a possible collision and slows down automatically while screaming a warning at you) and the Lane Watch – extra eyes in the back of your head for getting rid of that annoying blind spot (and haven’t there been moments when we’ve wanted things like these?). It also adds push-button start to the keyless entry and front fog lights. The VTi-L adds a panoramic sunroof, privacy glass, alloy sports pedals, dual zone climate control, heated front seats and a front parking sensor. The VTi-L + ADAS throws in some extra driver aids: forward collision warning, lane departure warning and the high-beam support system that automatically dips your front headlights when another car’s approaching at night (no more dazzling other drivers!). One thing that even the base model of the Honda HR-V doesn’t skimp on is the safety: airbags everywhere, daytime running lights, ABS brakes, EBD and hill start assist. Needless to say, the Honda HR-V also has plenty of child car seat preparation. In short, if you’re looking for a great family car that’s comfy, safe, roomy, versatile and can go anywhere, then you can’t go wrong with the Honda HR-V! For any more information on the Honda HR-V, or for that matter any other new car, contact one of our friendly consultants on 1300 303 181. If you’d like some fleet discount pricing (yes even for private buyers! ), we can submit vehicle quote requests out to our national network of Honda dealers and come back with pricing within 24 hours. Private Fleet – car buying made easy!